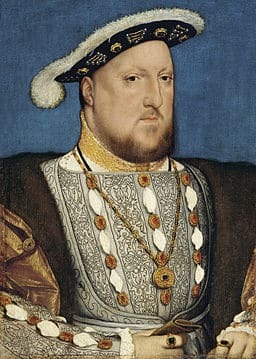 History paints King Henry VIII of England as a villainous glutton who hungered for food, women, and violence. But what kind of food satiated this famous king’s infamous appetite? In today’s blog, we will explore the exotic and lavish culinary habits of the British royal monarchy during the 1500’s—a time period known as the Tudor Dynasty. The Tudor family ruled England from 1485 to 1603 with five crowned monarchs; the two best known of these leaders are King Henry VIII (the “wife beheader”) and Queen Elizabeth I (the “Virgin Queen”). Elizabeth’s reign is often referred to as the Elizabethan era, or the golden age in English history. While most of us are somewhat familiar with the history of this time period, very few of us know much, if anything, about what they ate. This is my first historical food blog that is not directly related to Jewish food. While I’ll still be posting my weekly Jewish recipes, I’ve decided to branch out a bit and explore other parts of food history. I’ve chosen the Tudor dynasty this week because I have a personal connection to it. Recently while I was researching my ancestry, I started to look at the family tree of my paternal great-great-grandmother, Mary Jane Wyatt. After a lot of digging, I discovered that Mary was a direct descendant of Thomas Wyatt, a poet in King Henry VIII’s court. There is a lot to cover here, so I’m splitting this time period into two blogs. This first blog will focus on the royal Tudor diet and the foods enjoyed by the upper classes. In a future blog, I will cover the diet of the lower and emerging middle classes in Tudor England. For now, let’s explore what good old Henry himself might have eaten during his reign. If you want to experience royal Tudor cooking first-hand, schedule a visit to Hampton Court Palace, a favorite destination of King Henry and his daughter, Queen Elizabeth. The Hampton Court kitchens have been fully restored as a living monument to Tudor dynasty cooking. In their heyday, the kitchens occupied more than 50 rooms in the palace. A staff of 200 provided two meals per day for the 800 members of King Henry’s court (“dinner” around 11:00am and “supper” around 5:00pm). Cooking for a hungry royal court of this size was no easy task; it required massive amounts of ingredients. 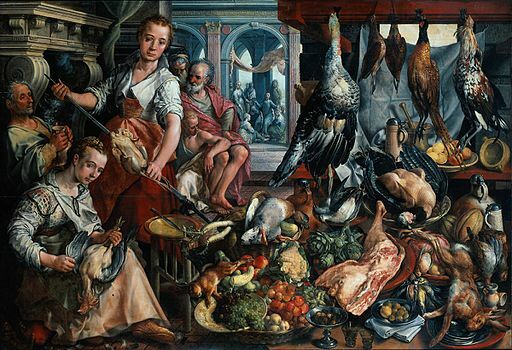 A provisioning list from the reign of Elizabeth I reveals the quantity of meat cooked in the royal kitchens annually: 8,200 sheep, 2,330 deer, 1,240 oxen, 760 calves, 1,870 pigs, and 53 wild boar. Most of the meat was hunted on royal land, though some was supplied from the palace’s own pheasant yard and rabbit hutch. Fish for Lent was supplied by the palace Pond Garden. Fruits, herbs, and English mustard were grown and harvested on the palace grounds; more exotic ingredients like spices and citrus were imported from other parts of Europe and the Orient. All of this food was prepared in Hampton Court’s Great Kitchen, a massive operation with six large fireplaces and roasting spit-racks. 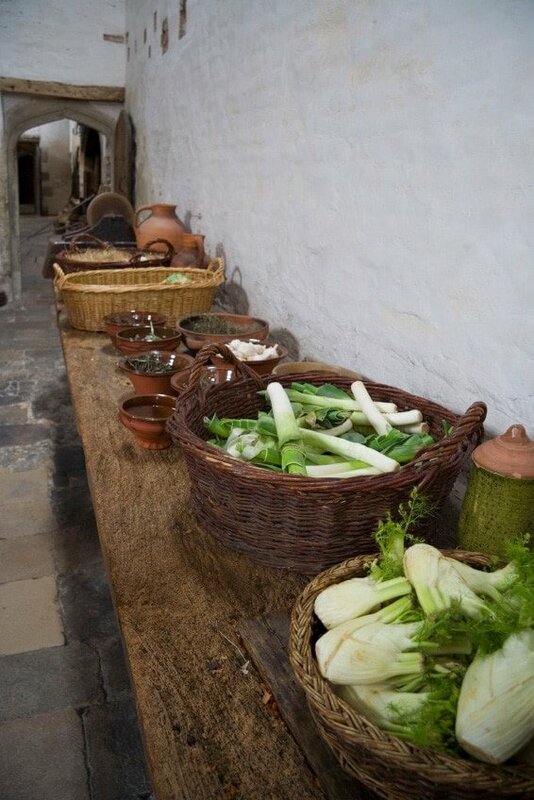 Meals were generally cooked over open wood-burning fires in the Great Kitchen. Meat stocks for soup and boiled meats were cooked in the Boiling House inside a gigantic 90-gallon boiling copper. Delicate desserts and puddings were baked in the Confectionery; pies, both sweet and savory, were baked in the Pastry House. Meat pies were one of the most popular dishes of the time period, and were enjoyed by both upper and lower classes. Upper class pies were made from fancy pastries of refined flour, often embellished with beautifully decorated pastry shells. When it came to royal cuisine, presentation was everything. The emphasis wasn’t on flavor so much as exclusivity—the rarer and more difficult to obtain an entree was, the more it was valued at court. “Delicacies” such as porpoise meat and grilled beaver tail were served at banquet, sometimes loosely interpreted as “meatless” alternatives for Lent. Food also doubled as entertainment; pies would sometimes conceal live animals like birds or frogs, which would be released when the pie was cut. 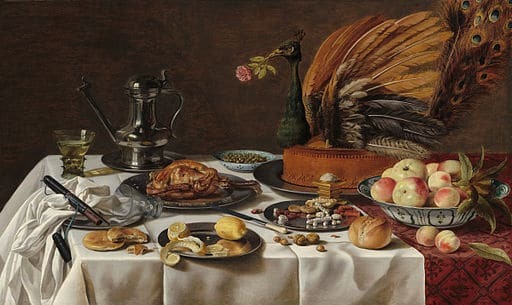 Roasted meats were often housed in their “original” dressing—for instance, a whole roasted peacock might be dressed in its own feathers, complete with a gold-gilded beak. While the royal Tudor diet was lavish, it was not at all healthy. Vegetables were considered poor man’s fare, and were only eaten sparingly by the royal court. Raw fruits were almost never consumed; in fact, they were outlawed in 1569 because at that time they were believed to cause illness. In the painting above you’ll notice a bowl of fresh fruits… the artist, Pieter Cleasz, was Dutch and did not share the British aversion to fruits and vegetables. Because of the lack of vegetables and fruits in their diet, many in the upper classes suffered from mild forms of scurvy. In fact, scurvy was so prevalent in London during the 16th and 17th centuries that it led Gideon Harvey, physician to Charles II, to describe it as the “Disease of London.” Enhancing the unhealthfulness of the Tudor diet was the prevalence of fat and sweets. Royal desserts were sweetened with sugar, which was expensive and rare in early Tudor times. The upper classes frequently battled tooth decay because of their increased sugar consumption. Queen Elizabeth herself was known to have quite a sweet tooth. Manchet—a white bread roll made from finely milled wheat—accompanied each royal meal. This bread was often served with thick slices of marmalade and jellies molded into all kinds of intricate shapes such as castles or animals. Citrus fruits like oranges and lemons were also enjoyed, but they had to be imported and were only reserved for the very wealthy. Spices like nutmeg, cloves, ginger, and saffron were used liberally in Tudor cuisine, as were sauces and garnishes. And of course, a Tudor meal wasn’t complete without a glass of ale to wash it down. Strong, sweet wine was the most popular drink with the royal court, which was stored by the barrel in their many castles across the English countryside. By way of example, about 600,000 gallons of ale were consumed per year at Hampton Court Palace—and that was just one of several English residences for the royal court. As we can see, the appetite of the Tudor Court was voracious and extravagant. While many items in the Tudor diet (like roasted swan, beef lung, or fillet of porpoise) might sound bizarre or unappetizing to our modern pallets, this time period actually produced some delicious recipes that are still enjoyed today, both in Britain and abroad. One such dish is rice pudding. Rice pudding is the descendant of earlier rice pottages, which date back to the time of the Romans, who however used such a dish only as a medicine to settle upset stomaches. There were medieval rice pottages made of rice boiled until soft, then mixed with almond milk or cow’s milk, or both, sweetened, and sometimes coloured. Rice was an expensive import, and these were luxury Lenten dishes for the rich. Recipes for baked rice puddings began to appear in the early 17th century… Nutmeg survives in modern recipes. Let me see: what am I to buy for our sheep-shearing feast? Three pound of sugar, five pound of currants, rice… I must have saffron to color the warden pies; mace; dates none– that’s out of my note; nutmegs, seven; a race or two of ginger, but that I may beg; four pounds of pruins, and as many of raisins o’th’ sun. To make a Tart of Ryce. As you can see, ingredient measurements were often not specified. Temperature was also left to the cook, because an open flame could not be controlled in the same way a modern oven can. Cooking times were not always included, and it was assumed that whoever was reading the recipe already knew how to cook, which means that there is very little in terms of detail provided. In adapting historical recipes, I’ve taken the liberty of assigning measurements, temperatures and cooking times, so you should have no trouble recreating these dishes in your own kitchen. This rice pudding uses historically accurate spices and ingredients that were enjoyed in Tudor times. It is only mildly sweet, gaining most of its sweetness from the raisins and currants. If you prefer a sweeter pudding, add more sugar to taste. Enjoy! Learn what the upper classes of Tudor England ate during the reign of Henry VIII and try a historically inspired recipe for Rice Pudding. Preheat oven to 350 degrees F. Steam rice until tender according to package instructions. 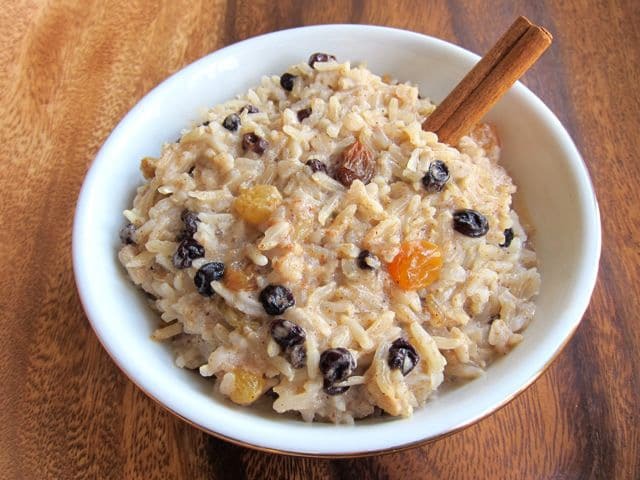 While rice is cooking, place raisins and currants into a small pot and cover with hot water. Bring just to a boil on the stovetop, then remove from heat. Let fruit soak in the hot water to plump. After rice has cooked, stir in the butter till melted. In a mixing bowl, whisk together milk, cream, egg yolks, sugar, cinnamon, ginger and nutmeg. Pour mixture into the rice and stir till combined. 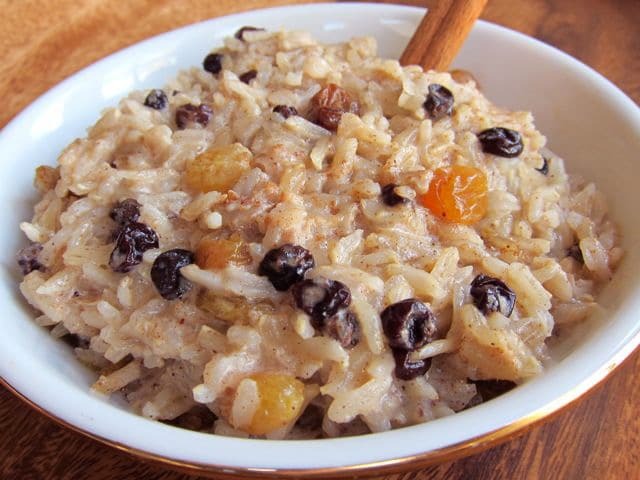 Drain the raisins and currants, then fold them into the rice mixture. Grease a 9x9 inch baking dish with butter or cooking spray. Pour rice mixture into the dish. Place in the oven and bake uncovered for about 45 minutes until the top of the pudding turns golden brown. Serve garnished with a cinnamon stick, if desired. Serve warm. Kiple, Kenneth F. & Ornelas, Kriemhild Conee (2000) The Cambridge World History of Food. Cambridge University Press. Meltonville, Marc (2007). The Taste of the Fire, The Story of the Tudor Kitchens at Hampton Court Palace. 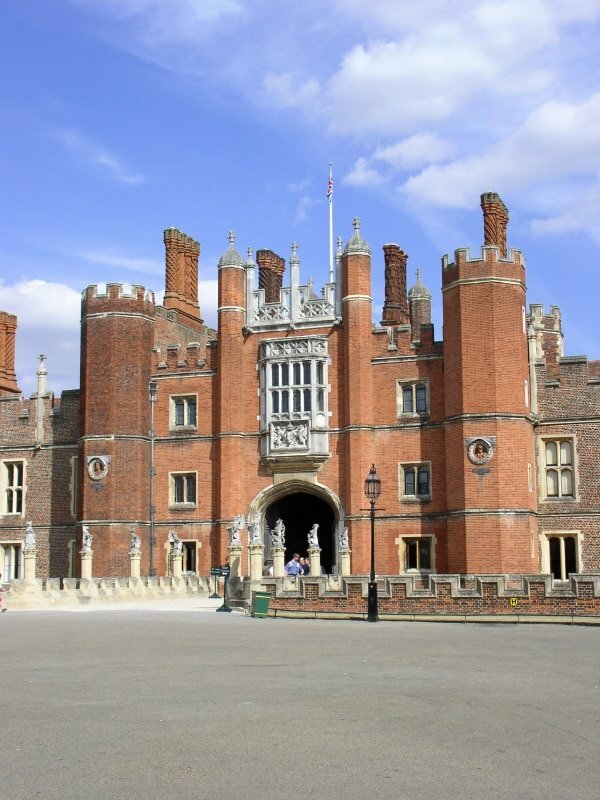 Historic Royal Palaces, Hampton Court Palace, Surrey, England. Shakespeare, William (original 1623, reprint 2008). A Winter’s Tale. Oxford University Press, USA. Trager, James (1995). The Food Chronology. Henry Holt and Company, Inc., New York, NY. This was a great post. It was well written and it is so nice to see a recipe from the past. God bless you. This looks fantastic, wonderful post as well. I’m really enjoying your website so far. The delicious rice pudding recipe you describe featured regularly in my childhood, growing up in Scotland; however it was baked in the oven in such a way that it became firm enough to be cut up into squares. These could be held in the hand and eaten like a piece of cake – a variation of or at least similar to bread pudding. Just read your rice pudding recipe alongside the Tudor recipe. I think that when the Tudor recipe says to ‘boil the rice’, it means in the milk and egg mixture, as one would with a modern English rice pudding (which uses a short grain pudding rice). To me, this makes more sense with original recipe, as the rice would absorb the rich milk/cream/egg mixture to become really deliciously creamy. Also, the short grain rice, or risotto rice as suggested above, would thicken the pudding. I am really looking forward to trying it with all the extra spices and orange juice as you suggest. Thanks for the recipe! I am a medieval re-creationist and one of my specialities is cooking from extant sources. I discovered the recipe for the rice tarts a couple of years back, and did my own version of a rice pudding for an event my re-creation group was hosting. I used arborio rice, and made an orange curd (with part lemon juice and part orange juice, as sour Seville oranges are actually what would have been used) with the egg yolks and the listed spices, them mixed the two together. It was served chilled, and was tart-sweet, creamy, and extremely yummy! What made you decided to add milk, cream, nutmeg and dried fruit to the recipe? The Good Huswife’s Jewell does not list any of these ingredients. You will get a completely different product when you use just the ingredients listed the recipe and it does not yield the kind of rice pudding the modern diner recognizes. Great post! I love the history of Tudor England. Very interesting time period. Thanks for pointing me to this blog. Usually I read your blogs but totally missed this one! I really enjoy your recipes, insights, and blogs. My family heritage is from Georgia Russia and eastern Turkey (molokans) so alot of your recipes are similar to what I grew up with and still cookk today. Thank you. I think it is interesting how many of the same dishes can transcend cultural bounds. My grandmother used to always make us a rice pudding similar to the one above complete with cinnamon and raisins. We called it Arroz con Leche. I love your blog by the way. What a cute post :-), I usually only read recipes and skip the rest of the text, but this was an exception – very nice read! I got to your blog following a link to those amazingly beautiful Challas, but I see that there are so many goodies here that I’m most certainly coming back. 10x! Ah, I am actually reading that book right now, will try to find that section. But the quote from his book makes sense and lies closer to my interpretation. I would probably have used aborio rice, or what we in Scandinavia calls porridge rice. That said, when making interpretations, they are just that and can follow the chefs preferences. The reason I got curious was that I had a discussion about long-grained vs. short-grained rice just the other day. Thanks, feel free to comment at any time. I am trying to collect some of the thoughts from last year into a viking-age cookbook. Hopefully, that project will be finished by winter. By the way, as you have some insights into middle-east historical cooking, have you tried any of the recipes that has been found on cunieform tablets? I find medieval & renaissance food quite interesting, and are currently working on renaissance food from a Scandinavian perspective. So it was nice to see your interpretation of the rice pudding. But, I am a bit curious as to one point of your interpretation as it is something I have wondered about my self. In your choice of rice, why did you settle on basmati? Have you find any good sources describing the rice used? Daniel, I used basmati as a flavor preference in this recipe. According to Peter Brears’ “Cooking and Dining in Medieval England,” “Rice production originated in prehistoric Asia but during the fifteenth century the North Italian plains were growing much of the rice imported into England by the Venetian and Genoese spice-ships. For this reason the short-grained ‘pudding’ varieties should be used, these presumably being in their polished rather than brown forms, since this was a high quality food, in which whiteness and purity were of some importance.” I highly recommend this book, as well as Peter’s book “All the King’s Cooks” (which I think is about to be re-released soon), as terrific resources on both Medieval and Tudor period cooking. Great article and amazing amount of historical data, thank you for sharing! It’s palates that make our tastes, though. Deliveries arrive on pallets. Fascinating. What a dreadful diet the Tudors had! No wonder Henry went through so many wives in search of an heir. I’m surprised they had the requisite health for debauchery on such unhealthy fare. I love this for so many reasons– starting with my being a history nerd who toured Hampton Court twice while living in England. Second, after a very unusual (and alcohol heavy) Passover with a good friend’s family, we now have the tradition of singing ‘Henry VIII’ at our Seders every Passover. And third, I LOVE rice pudding. This made my day! I grew up and still eat alot of rice as a side or as part of the main dish. However, I generally do not like rice pudding, but this actually looks really good, will have to try it! Thanks and I’m looking forward to your new food history blogs! Thrilled you all enjoyed this! Marianne, that custard sounds delish– what is the name of the cookbook from 1890? Kathy, I would LOVE to talk more about the fate of Thomas Wyatt. He was eventually released from the Tower of London because of his father’s political connections– plus there was never any real proof that he had an affair with Anne, though apparently he was quite smitten with her. 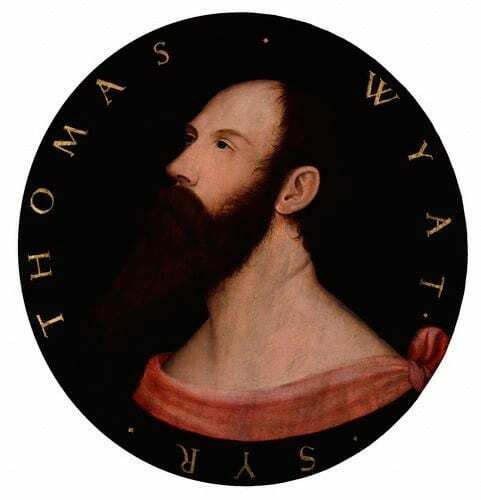 Thomas went on to marry and have a son, Thomas Wyatt the younger, who led a rebellion against Queen Mary (Henry VIII’s daughter and heir to the throne). He was eventually executed (beheaded) for treason, but not before he had a son, George Wyatt. Funny to consider– if Thomas the younger had been executed before having a son, I wouldn’t be here! George also had a son, Sir Francis Wyatt, who became governor of the state of Virginia in 1621. Virginia happens to be my favorite state to visit, and I was drawn to it long before knowing all of this. I find it all very fascinating! As for the eggs– just leave them out. It will taste fine without. A little less rich, but still delicious. The eggs are a distinctly Tudor part of the pudding; most modern rice puddings to do not contain eggs. I loved reading this as well!! I think you should have talked wee bit more about the fate of Wyatt. Is there a way to make this pudding without eggs? This is so wonderful and artistic. Thanks “Shiksa” for sharing this with the world! I love rich pudding so this is a great recipe for me to try. Thanks for you great blog. I was so excited to read your blog and find a recipe for a family favorite. Yummy, rice pudding is a favorite of mine. Job well done. I love historical recipes. My favorite custard recipe is from a cookbook published in 1890. It uses 8 eggs, a quart of milk and a knob of sugar. I added a little vanilla. Beat the stuff together and bake in a 350 degree oven in a water bath until a silver knife comes out clean. Thanks for the blog – I get excited every time I read it! Very interesting..I have visited England 3 times and your recipes and writing about the Tudor Era, makes me want to visit again. Thank You for your blogs, I really enjoy them all. Shalom Sister! Fascinating. Tori is becoming a Culinary Archeologist. I like it!